First step: Peel and devein the shrimp. Easier than you think. Open the shell length wise on it's belly ( the inside that curved). Starting at the head end pull back the shell. Gently pull back the tail or leave the tail on if you prefer. Second step: Cut a slit on the back side of the shrimp from the head to the tail with a sharp knife. Third step: Using the tip of the knife locate the vein place the tip of the knife under it to remove. Rinse under cold water. Note: the vein is actually the intestinal tract that can impact the flavor immensely. How to cook shrimp: In a large sauce pot of water add a sprinkle of salt. Bring to a boil. Add shrimp. Cook in boiling water 1 to 3 minutes until the shrimp turns pink. 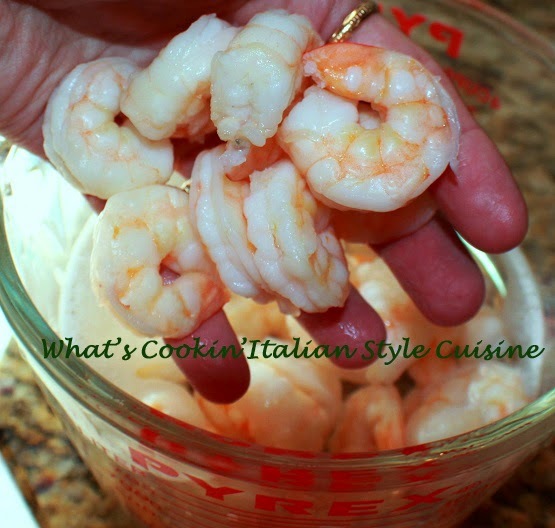 Drain and rinse shrimp under cold water. They are now ready to use for many favorite recipes to include fried, cocktail, broiled, grilled just to name a few.